There is about a factor-of-two difference in the thermal expansion characteristics between steel and bronze. Depending on the processing details (how well the steel and bronze actually bind together) there will be temperatures low enough that voids will open at the steel-bronze interface, and there will be temperatures high enough that the thermal stress rises above the yield (or ultimate) stress of the metals. The strength properties should show some interesting behavior at elevated temperatures because the bronze will be trying to rip apart the surrounding steel. One of the things that bothers me about this contest is that they use some youtube videos of test firings of a DMLS chamber, and make it seem like what they are asking the contestants to do will be similar. DMLS is a process that results in a near-net shape part with a homogeneous material that is at least somewhat comparable to normal metal materials that have well characterized properties (especially at the high temperatures and temperature gradients that will be seen in this application, it's safe to assume that these are room temperature properties). Since they are made from a pre-alloyed metal powder, DMLS parts will have none of the CTE mismatch problems described above. As the disclaimer on the Shapeways site indicates: Higher temperatures may significantly change material properties. There is the significant possibility that this contest will result in a black-eye for additive metal fabrication that is undeserved (FUD fighting is hard enough already). There are additive processes for real, reliable metal materials that are ready for prime-time engineering applications. Shapeway's current metal printing process is not one (though an indirect process based on investment casting could be quite suitable). Update: The Make editor replied to my email inquiry and posted the comment; they posted this one too after a bit of delay. Critical comment on TechCrunch: "...all terrible proofreading aside, that statement is truly laughable and reveals the complete lack of domain experience that DIY rockets has in aerospace..."
Question (PSFK): Is there any concern over 3D printing material handling the workload/heat/etc required from rockets? 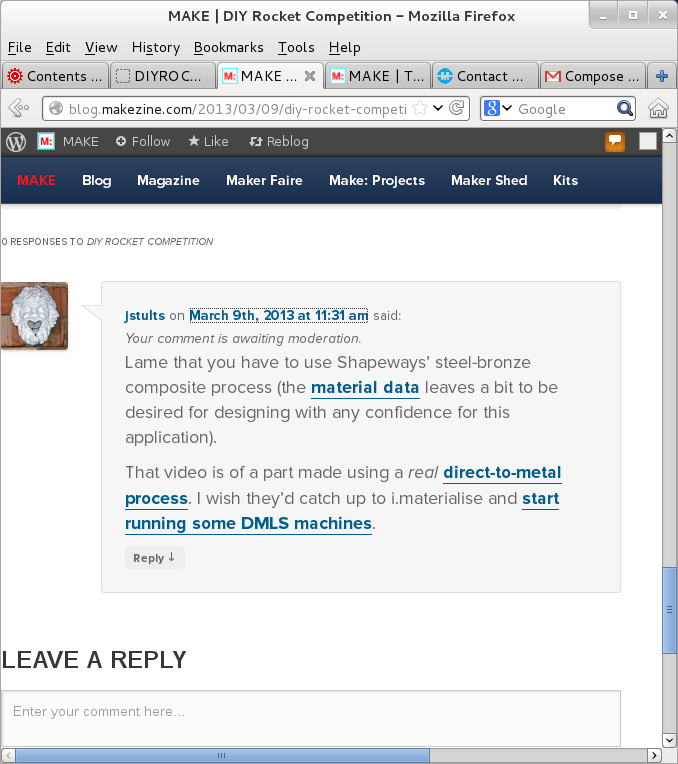 Answer (Darlene Damm, co-CEO DIYROCKET): Shapeways, which is providing free 3D printing for the prizes, is able to now print with stainless steel, not to mention 3D printing is advancing at a very fast rate with new developments coming out every few weeks. We know of at least one example of a small 3D printed rocket engine that is going through tests, but has not been used for launch yet. We picked this technology for the competition because we feel it is on the cusp of cutting edge innovation and what is possible to create. We recognize that there are a few challenges to still overcome, but know that the amount of amazing 3D printing technology now available plays into our favor. We feel that this technology has tremendous potential for driving down costs and addressing the access to space issue (high cost of transporting goods from earth to space), so by targeting it with the competition, we are hoping to dramatically speed up the R&D process. In short, we are hoping to see some exciting entries and collaborative work on the platform that will be advancing the technology, and because of the open design of the contests, ensuring that info is also shared with the 3D printing companies and others. This is also the “design” stage of the contest. While not confirmed, we hope to run additional competitions around testing the technology. We are hoping to push this technology forward with targeted efforts. 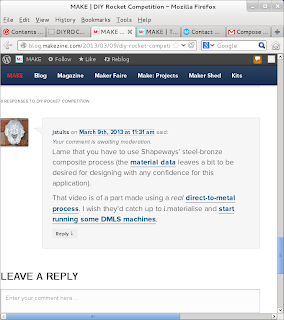 Shapeways does not print stainless steel. They print some peculiar composite of steel and bronze. Might the competitors need "material properties" for the "design" stage of the contest!? Nah, don't sweat the details, we're "disrupting" things here! Winning entry printed with DMLS in Cobalt-Chrome, and test fired. Other entries for the competition listed here. The first place entry noted the problems with using the shapeways material for this application and came up with an interesting solution: electroplate a copper liner on the inside of the part to increase the thermal conductivity.